Edition: La Boite, 2004. Playlab Press, 2004. Patrick Mayne was a poor Irishman who emigrated to Australia in the first half of the 19th century. Settling in Brisbane, Queensland, he built his fortune as a butcher, landowner, and town councillor, and left an extraordinary legacy: a deathbed confession of murder that had a profound impact on the lives of his wife, his children and the colonial society he helped to build. The Mayne Inheritance follows the story of the Mayne family throughout a period of nearly one hundred years. 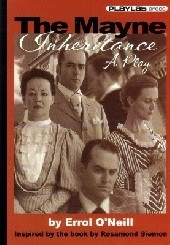 Although small portions of the play take place in London and New Zealand, the heartbeat of the play is found in Brisbane. The locations mapped here focus on Brisbane, and the strong connection between this troubled family and the city's history. Rosanna Mayne spent most of her later years in the infirmary at the All Hallows Convent on Anne St. Although Rosanna grew up in the family home on Queen St and spent some time teaching in Toowoomba, All Hallows was her home for most of her life, and she left her share of the estate to the Sisters of Mercy. All Hallows School and Convent was built in the 1860s, and is still active as a Catholic girls school today. MARY: Rosanna's had a nervous breakdown. JAMES: What have they done with her? MARY: They've put her in the infirmary. JAMES: She was never suited to the life. It's no wonder. DUHIG: Talking of Archbishop Dunne, I know he had great affection for your sister Rosanna. He often spoke of her. The Sisters of Mercy tell me she's become quite a burden. I wonder if you could give some thought to taking over her care. MARY EM: Here, at Moorlands? DUHIG: The nuns that care for her now could be released for more important duties. DUHIG: I'd like you to consider the question, at any rate. MARY EM: She's been with the Sisters for over forty years. All Hallows is her home. After being suspected of involvement in the murder of a Japanese man, Isaac Mayne was put in an asylum at Cooks River. He lived in the asylum until his death by suicide in 1905. NSW State records show that the asylum at Cooks River was know as Bayview House, and was located in Tempe, NSW. Trove has record of the newspaper announcement concerning Isaac Mayne's death. LILIAN: What was their diagnosis? LILIAN: How long do you expect his to be there? JAMES: He won't be coming out. The Mayne family butcher shop and adjacent home on Queen St is a key setting in The Mayne Inheritance. Patrick Mayne's deathbed confession takes place here, as well as scenes in the surrounding area such as such as the Queen St fire. MARY: You're content here, aren't you? PATRICK: Aye. Moggill is the wilderness. Kangaroo Point is a village, South Brisbane will never amount to anythin'. This will be the centre of town. Do you not see the excitement comin' off the very street? MARY: You're worried about Queen St? Bejesus! Did you not care about your own wife, to keep this from me all this time? ROSANNA: Mummy, Daddy, there's a fire! ROSANNA: Up Queen St! Quickly! PATRICK: Jesus, Mary and Joseph! Me shops! Me shops! Mary! Come on! In The Mayne Inheritance, family property at Moggill is the site of regular picnics, and is also suggested to be the place were Patrick and Mary Mayne courted. James and Mary Emilia Mayne donated 280 ha of land in Moggill to the University of Queensland for agricultural education. WILLIAM: Let's go for a walk along the riverbank. MARY EM: This is where Mum and Dad did their courting, you know. they walk. William is looking at Patrick. WILLIAM: How do you know that? PATRICK: The boilin' down works was just over there. Mary was a domestic up there, round the bend. The Mayne family moved from Queen St to the family home at Moorlands in the decade following Patrick Mayne's death. The family home was designed and built by architect Richard Gailey, and most of the Mayne children lived at Moorlands the rest of their lives. After the deaths of James and Mary Emelia, Moorlands was donated along with the family wealth to the University of Queensland. In later years, it was sold to the Uniting Church, and is now part of the grounds of the Wesley Hospital. ISAAC comes in with a large piece of paper. ISAAC: These wont be approved. WILLIAM: They're just preliminary sketches, Isaac. ISAAC: A prison. As if we weren't already in gaol. Up tempo turn-of-the-century music. Mary Emelia, continuing the dance from the previous scene, finishes swirling. FLORENCE: Good evening, Mary Emilia. What a grand house! The Mayne family enjoyed many holidays at Sandgate. The sound of seagulls and the gentle wash of waves. James and Mary Emilia walk on the beach. James is thrilled to be back in the place of happy childhood memories. He takes of his shoes, jacket and tie. JAMES: Just how I remember it. Even better. James and Mary Emilia Mayne donated the land for the University of Queensland campus to be built at St Lucia, where the campus currently is situated. JAMES: This land up the river just here. We could buy that and offer it for the new site. JAMES: The University has to move. They're running out of room in George Street. MARY EM: They won't want to go all the way out there. St Lucia? Two of the Mayne children, Isaac and James, visit the Supreme Court to read the court transcript on Robert Cox's murder case. The location of the original Supreme Court was on George St, Brisbane, in the Law Courts Complex. In 2012, the court was moved to the new Queen Elizabeth II Courts site. The site is now part of the location for the development project called '300 George St'. Dim lighting. Isaac waits. Bernard, a clerk, enters carrying a lantern and a bundle of old documents. BERNARD: Bit of a labyrinth, isn't it? A number of Court records were lost during the flood. But I've found the case you wanted. You'll have to sign for it. Bernard places the documents and the lantern on the table. Isaac signs a book. Eighteen forty eight. No-one's looked at this transcript for years. Best forgotten. The plaintive Irish tune we heard in Scene 1 establishes. James is sitting at the table, reading the surgeons report by lantern light. We get the sense that he has been sitting there for a long time, and is very much affected by what he has read.